As you all know I love to entertain myself with different Nokia sites. So coming across this post on Howard Forums did nothing more than interest me. Nokia India has launched a personal Moblog for NSeries users to "share their world, with the world". 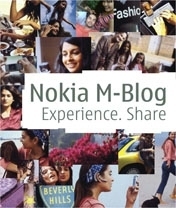 Nokia M-Blog is designed as a sort of personal diary for NSeries users. Users install the application to their phone, register and then upload their images to their own Nokia Moblog like this one. Kind of reminds me of how PicoBlogger was when it first came out. The site states that the current supported handsets are the N70 and N90. I don't have an NSeries phone yet, but it didn't stop me from installing it onto Charlie (aka Nokia 6630). Not to mention the fact that I didn't think it would even work, but at 3am and suffering from insomnia, I figured what the hell. Techtree.com introduced the launch yesterday on its website. Shyam Sundar, business manager - imaging solutions, Nokia India, said, "Mobile Blogging will provide users the freedom of sharing their World at anytime from anywhere. Nokia s new M-Blog application will not just enable bloggers to share their moments instantly, but will also open up a whole new paradigm to the blog universe. It s no more just shoot-show-throw with Nokia M-Blog, we are providing consumers an exciting mode of sharing their world, with the world." Yes Darla - it looks like PicoBlogger version 1.0. Did you manage to try 3.0 yet?